Ever since we were introduced to the Internet, we began discovering websites. Today, we can’t live without them and view hundreds, perhaps thousands, every year. We use them for education, working, shopping, entertainment, travel and gathering all sorts of information. Viewing that many sites should make us all experts on what makes a good website or a bad one. Plenty of businesses have what may be considered less-than-professional sites, so perhaps the quality issues aren’t so obvious. When Randy and Cathy Wiest, Wyomissing, purchased Happy Paws Pet Sitting, they knew the existing website was outdated. Randy believes it was made using website development software and lacked professionalism. 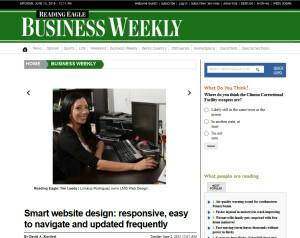 The Wiests turned to Limarys Rodriguez, owner of LMG Web Design LLC, 580 Willow St.
Rodriguez said she first has to discover what her client is looking to achieve. “Every business is different as far as goals and missions,” Rodriguez said. Rodriguez said she sees two major factors in creating a good website: making it responsive and easy to navigate. Shawn Borelli, owner of Borelli Designs, Ontelaunee Township, said communication with his clients is essential. 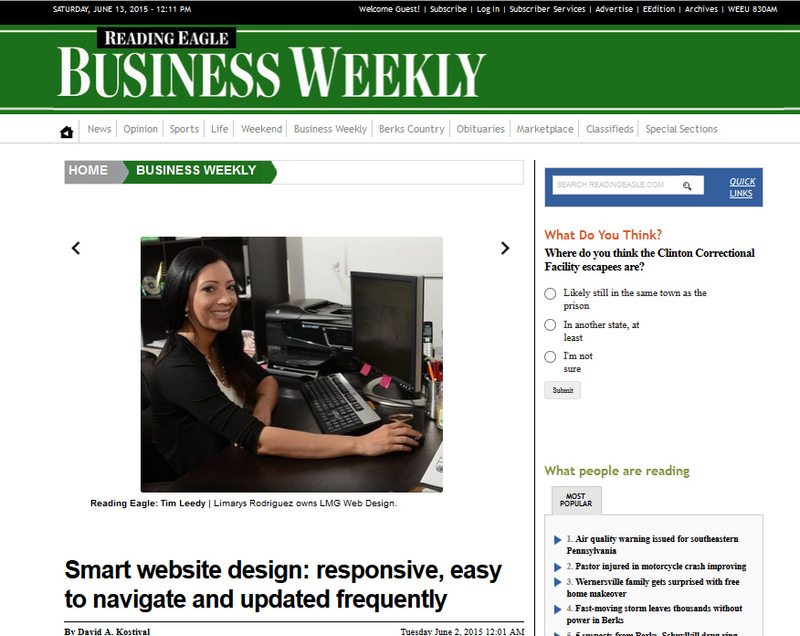 Borelli agreed with Rodriguez, saying you have to focus on designing a responsive website. “When we do develop a website, it is important that it does respond to a variety of screens,” Borelli said. “I have to make sure I am coding the site so that it is one entity and responds to all screens. Borelli explained that it is important to optimize a site to incorporate key words to target an audience. “We run an analysis of what customer searches are bringing the most traffic,” he said. Borelli said that starting April 25, Google changed its rules so that it is favoring websites with mobility. “More than 50 percent of people are doing searches on mobile devices,” he said. Rodriguez said there are two huge mistakes business owners can make. One is failing to create a website because owners want to rely on Facebook. The other is allowing a website builder to brand the site. One website domain registrar and Web hosting company is GoDaddy, which claims to maintain about 59 million domain names. “GoDaddy does that, and it’s horrible because that makes it look like it was not worth investing in yourself,” Rodriguez said. But Rodriguez said she recommends clients do both, as social media can tie into optimization. Pam Gockley, owner of Vigilant Communications, Leesport, said she approaches website design differently than most designers. Gockley explained she starts by finding out, using a client survey, why they are coming to the site. Gockley said she believes websites should make it easy for clients to express a compliant or to offer you praise. All three designers said websites should be updated often to keep them fresh. Search engine companies such as Google and Bing require relevant and constantly updated content and want to drive users in that direction. Rodriguez suggested the easiest way to update is to include a blog on the site. Rodriguez said she always recommends including a phone number in the website’s footer and the header areas. “The goal is to have people call you,” she said. Borelli said he likes to make good use of photography and graphics on the home page. Gockley believes that a business needs a professional website to be competitive. Contact David A. Kostival: money@readingeagle.com.